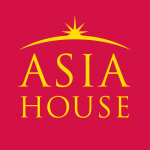 The BJP’s victory in the 2014 national (Lok Sabha) election defined the party as the central pivot in Indian politics replacing the Congress Party and made Narendra Modi the country’s prime minister. It was the first time in 30 years when a single party had won a majority of seats in the national parliament. This election also saw Congress slumping to its lowest seat share, and the decline in the fortunes of many regional parties, which had gained prominence since the 1990s. It is doubtful whether forming an anti-BJP front without a clear common narrative and policy agenda could be successful at the national level. 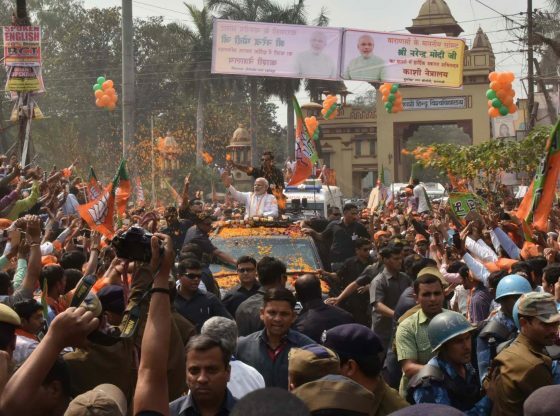 The BJP’s success led to claims by some scholars and commentators that this election marked the beginning of a new phase of a BJP-dominated party system in India. That said, the party’s victory was achieved on the basis of a relatively low 31 percent vote share, and dominance in specific geographical areas, which makes its seat majority somewhat fragile. 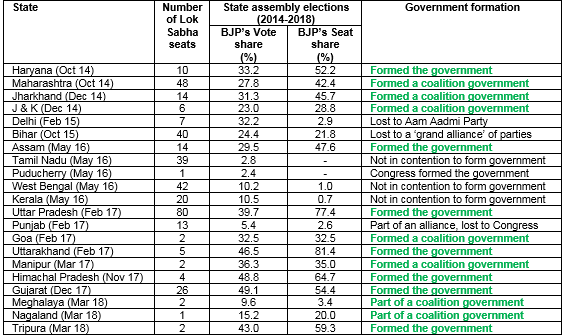 The BJP’s performance in the subsequent state assembly elections (Table 1) has reinforced its ascendance, with Modi and Amit Shah, the party president, vigorously pursuing expansion of the party’s geographical footprint. Modi continues to be the party’s primary vote-catcher, and the BJP has continued to leverage, with a high degree of success, his popularity to win many subsequent state assembly elections. As a result, in addition to being in power at the centre, BJP now runs the government in 21 of 31 Indian states (and union territories) either on its own or with its allies, and has displaced the Congress as the central force in Indian politics. Congress on the other hand has lost further ground, and its leader and the party president, Rahul Gandhi, has not been able to revive the party’s prospects. The regional and the Left parties are also less influential than they were prior to 2014 national election although some of them remain dominant (eg Trinamool Congress (TMC) in West Bengal) in many large Indian states. The results for Lok Sabha by-elections since the 2014 national election have not been as favourable for the BJP. During the last two years, the BJP has lost 10 by-elections, and in particular, its recent defeat in Gorakhpur and Phulpur in Uttar Pradesh has been a major setback for the party and has given some hope to the opposition. Unless called earlier by the government, the next national election will be held in the second quarter of 2019. Given Modi’s popularity, the BJP’s expanded geographical footprint, the diminished influence of regional and Left parties, and no obvious signs of Congress’ revival, the BJP appears to be well-placed to earn another term in power. However, it faces many challenges to win a majority of seats on its own, which it was able to do in 2014. Parties in power in India tend to face an anti-incumbency factor because their policies have somewhat converged, and they are not able to deliver on their electoral promises. Voters can therefore be more inclined to shift their support, leading to the incumbent party’s defeat. During his campaign in 2014 national election, Modi made several promises to the electorate, the overarching one being delivering Acche Din or Good days. It is inevitable that his performance would not satisfy all sections of voters, and therefore they could choose to vote for another party in the 2019 election. The relations between the BJP and many of its alliance partners have worsened since the 2014 national election. Recently, one of its key allies, Chandrababu Naidu of the Telugu Desam Party has left the BJP-led National Democratic Alliance over the issue of special status for the state of Andhra Pradesh. There are similar tensions in the BJP’s relations with its other key allies, for example the Akali Dal in Punjab and the Shiv Sena in Maharashtra. Loss of allies could be detrimental to BJP’s chances to form the government again in 2019. Some regional parties are in discussion to form an anti-BJP electoral alliance in the form of a ‘federal front’ so that BJP faces a more united opposition in 2019. This initiative is also motivated by the recent success of rival regional parties in joining hands to defeat the BJP in Lok Sabha by-elections in Uttar Pradesh. However, there does not appear to be a general antipathy against Modi, and therefore, it is doubtful whether forming an anti-BJP front without a clear common narrative and policy agenda could be successful at the national level. An alliance of regional parties was successful in forming coalition governments in the 1990s but the current scenario is different because the Modi-led BJP is in a much stronger position than either the Congress or the BJP at that time. In addition, the regional parties are a relatively diminished political force. Further, a federal front is unlikely to boost opposition unity without the participation or support of the Congress, which will not be easily forthcoming especially on the issue of leadership. As of now, Mamata Banerjee, the leader of TMC is projecting herself as the leader of the federal front, and other regional leaders may also have similar ambitions. Congress, on the other hand, will be keen to project Rahul Gandhi as the prime ministerial candidate against Modi. One needs to be reminded that it was BJP’s sweep in key states in the Hindi belt and Western region in 2014 that helped it to convert a relatively low 31 percent vote share into 52 percent of seats under FPTP (see Figure 1). Source: Election Commission of India election statistics, author’s calculations. FPTP also played a role in the BJP’s victory in many recent state assembly elections. For example, in Uttar Pradesh, it won 77 percent of seats based on a 40 percent vote share, while the Samajwadi Party suffered a loss of 44 percent in seat share with just a 7.7 percent decline in vote share. In general, a small negative swing in votes can lead to substantial reduction in the seat share under FPTP, and this makes the BJP vulnerable to losing a non-trivial number of seats in 2019 especially if it faces a more united opposition. The results of Indian national elections are difficult to predict and continue to be a summation of electoral outcomes in different states, each of which has a distinct party system, social cleavages and issue dimensions. This complexity is compounded by FPTP, which usually favours parties with concentrated geographical support. Although some of Modi’s initiatives such as demonetisation of certain currency notes, implementation of a nationwide Goods and Services Tax (GST) have been criticized, and his government blamed for not being able to address basic issues such as growing unemployment, farmers’ distress, he remains the country’s most visible leader. Given the anti-incumbency factor, loss of allies, and the possibility of greater opposition unity, BJP’s seat tally in 2019 is likely to be lower than in 2014, and it may not be able to achieve a majority on its own. However, even in that scenario, the party is likely to emerge as the single largest party by seats, and a clear frontrunner to form the next government with allies.